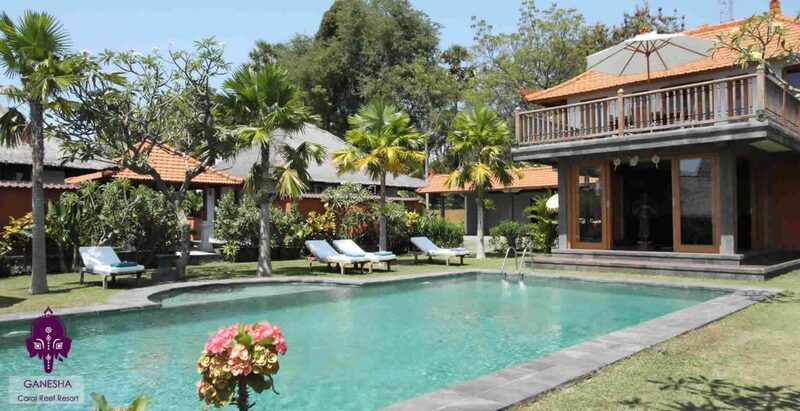 Ganesha Bali offers eight luxury villas in two types, the Garden View (2 villas) and the Sea View (6 villas). 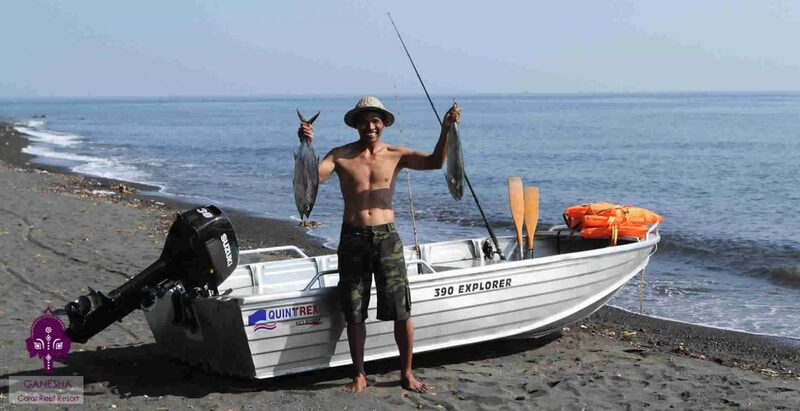 The villas are situated along the beach where the rice fields meet the ocean. 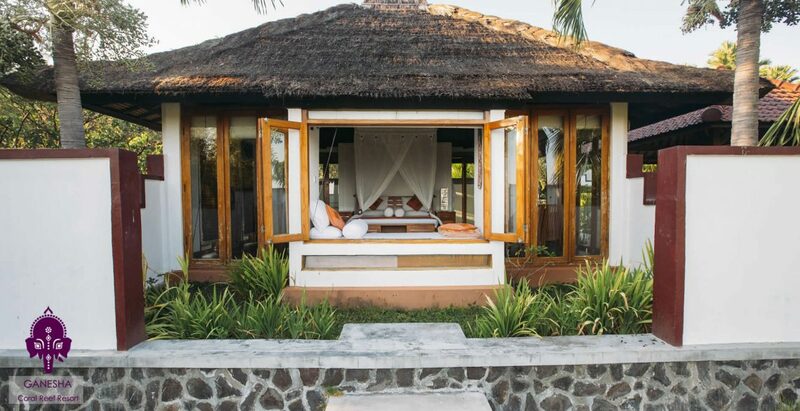 All villas are spacious, freestanding and private. 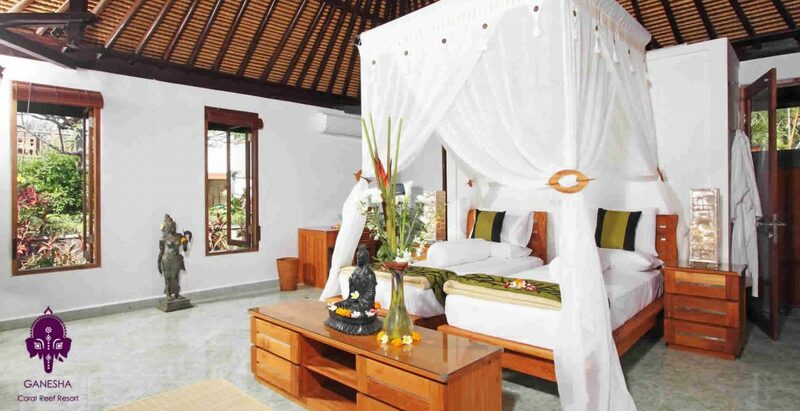 The villas have a traditional thatched alang roof with high ceilings and an abundance of natural light. Get a discount if you book for one week or more – see the RATES page. Overlooking the tropical garden of the Ganesha Bali resort. Open-air stone bathrooms with shower, vanity basin, and mirror along with hot and cold running water. Air conditioner and ceiling fan. Mosquito net. Safe. Timber Blinds. Handcrafted teak furnishings from Java including bedding, side tables, chest of draws, wardrobe, writing desk and table with six chairs in the private bale. Mini bar fridge. Hot and cold filtered water dispenser. Tea and coffee making facilities. Linen and towels. Bathrobes for the adults. Along with shampoo, conditioner, body wash and soap for your convenience upon arrival. Overlooking the Bali Sea. Open-air stone bathrooms with shower, vanity basin, and mirror along with hot and cold running water. Air conditioner and ceiling fan. Mosquito net. Safe. Timber Blinds. 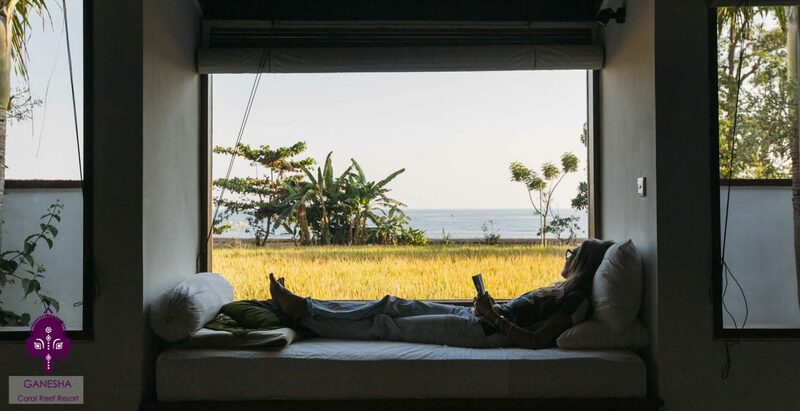 Handcrafted teak furnishings from Java including bedding, side tables, chest of draws, wardrobe, writing desk and table with six chairs in the private bale. Small private court. Mini bar fridge. Hot and cold filtered water dispenser. Tea and coffee making facilities. Linen and towels. Bathrobes for the adults. Along with shampoo, conditioner, body wash and soap for your convenience upon arrival. Restaurant which utilizes the best of fresh, organic local and imported produce along with local and imported beers, wines and spirits. Check-in 12:00 – 23.00 hrs. — Early check-in or late check-out subject to room availability on the relevant day.